Description: Plato�s Parmenides and Its Heritage presents in two volumes ground-breaking results in the history of interpretation of Plato�s Parmenides, the culmination of six years of international collaboration by the SBL Annual Meeting seminar, �Rethinking Plato�s Parmenides and Its Platonic, Gnostic and Patristic Reception� (2001�2007). Volume 2 examines and establishes for the first time evidence for a significant knowledge of the Parmenides in Philo, Clement, and patristic sources. It offers an extensive and balanced analysis of the case for and against the various possible attributions of date and authorship of the Anonymous Commentary in relation to Gnosticism, Middle Platonism, and Neoplatonism and argues that on balance the case for a pre-Plotinian authorship is warranted. It also undertakes for the first time in this form an examination of the Parmenides in relation to Jewish and Christian thought, moving from Philo and Clement through Origen and the Cappadocians to Pseudo-Dionysius. Contributors to volume 2 include Matthias Vorwerk, Kevin Corrigan, Luc Brisson, Volker Henning Drecoll, Tuomas Rasimus, John F. Finamore, John M. Dillon, Sara Ahbel-Rappe, Gerald Bechtle, David T. Runia, Mark Edwards, Jean Reynard, and Andrew Radde-Gallwitz. 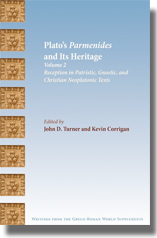 Citation: Thomas P. Nelligan, review of Kevin Corrigan and John D. Turner, eds., Plato's Parmenides and Its Heritage, Volume 2: Reception in Patristic, Gnostic, and Christian Neoplatonic Texts, Review of Biblical Literature [http://www.bookreviews.org] (2014).